Many cities envy Madison, WI’s thriving State Street retail corridor. After being converted from a four-lane road to a pedestrian-focused thoroughfare in 1974, State Street has become synonymous with funky retail stores and welcoming locals. It’s a draw for University of Wisconsin students, residents, and visitors alike, and an important economic and cultural asset for the city. According to Downtown Madison Inc.’s latest State of Downtown report, Madison’s Central Business Improvement District (BID), which contains State Street, saw vacancy rates decline from 7.5 percent in 2012 to just 4.6 percent in 2014. In recent years, however, the mix of retail on State Street has trended toward businesses focused more on food and drink and less on goods and services. According to Downtown Madison, Inc., 40 percent of businesses in the Central BID are food and drink businesses—but only 25 percent are other types of retail. Local leaders are concerned that if this shift continues, the area will fail to meet the everyday needs of local residents. Officials and residents of Kenosha County, in partnership with Downtown Kenosha, met with representatives from Smart Growth America on May 6 and 7, 2014 as part of a free, grant-funded technical assistance program. The workshop provided the City with tools and strategies to develop a Complete Streets policy in line with the City’s Downtown Strategic Development Plan, which forms the basis of efforts to revitalize Kenosha’s downtown. A Complete Streets policy will help the City plan and design its streets to be safe, comfortable and convenient for people of all ages and abilities, whether they are walking, bicycling, driving, or hopping on public transportation. On the workshop’s first day, residents gathered for an introductory presentation that provided an overview of the benefits of Complete Streets and the policies that support them. The next day was an all-day workshop where key stakeholders met with instructors from the National Complete Streets Coalition to discuss the various types of Complete Streets policies, what the right approach could be for Kenosha, and how Kenosha can move forward with developing its own Complete Streets policy. The National Complete Streets Coalition reports on the national epidemic of pedestrian fatalities, offering county-, metro-, and state-level data on traffic fatalities and an interactive map of each loss in the decade 2003 through 2012. This resource specific profiles the state of Wisconsin. Madison, WI has attracted businesses and residents to locate in its downtown by making it a great place to live, work and relax. Photo via Flickr. Madison, WI, received high marks in our recent report Measuring Sprawl 2014—thanks in large part to the city’s efforts to focus development near downtown. How did the city achieve this success? And what can other communities learn from Madison’s example? Measuring Sprawl 2014 used four factors to evaluate development: density, land use mix, street connectivity and activity centering. Every major metro area in the country was evaluated on these factors, which were then combined to create a metro area’s overall Sprawl Index score. On September 10, the Metropolitan Planning Organization, Capital Region Sustainable Communities, and Capital Area Regional Planning Commission – all organizations of the city of Madison, Wisconsin – met together to present a study carried out by the city testing the idea of a Bus Rapid Transit (BRT) route to the public and receive feedback. This initial meeting was meant to introduce the idea to the public, with the next round of feedback involving more public input on specifics of the plan, including stop location, frequency, and stop amenities, among other things, according to Joe Kern, Project Manager of SRF Consulting. The study was funded by a three-year HUD Regional Planning Grant. 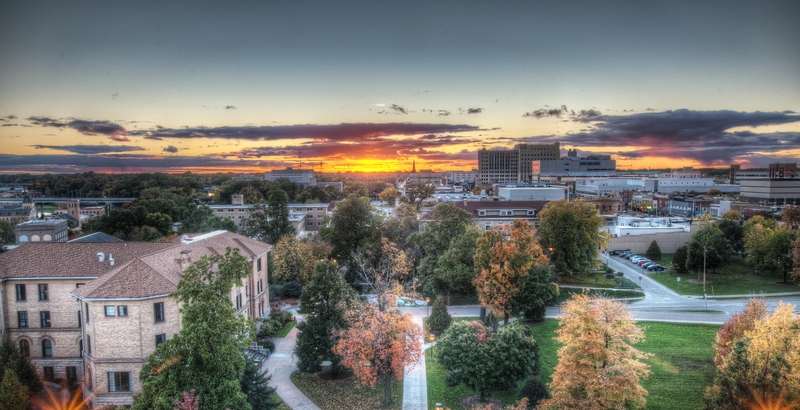 Unsustainable growth, lack of economic opportunities, community health concerns, and loss of natural resources—these are issues facing cities and towns across the country, and Madison, Wisconsin is no exception. But, regional planning organizations in the Greater Madison area are now attempting to confront these endemic issues in a strategic and sustainable way that utilizes Madison’s strengths rather than allowing its weaknesses to be barriers to an effective response. Smart Growth America is proud to welcome Madison Area Bus Advocates to our coalition of state and national allied organizations. Madison Area Bus Advocates works for an expanded and improved urban and regional bus system to serve more people, places, and trips throughout the greater Madison, WI area. The organization is a diverse group of bus users and friends who believe that good public transit supports the dignity and freedom of all individuals, creates an open, hospitable and welcoming community, respects the environment, opens economic opportunity to all and moves people to where they need to go. A variety of transportation options – including good bus service – needs to be available in the greater Madison area so people and businesses can choose a transportation mode that considers convenience, time, health, safety and cost. We want an expanded and improved regional transit system that includes better transit options within the city of Madison itself.